There is a lot of sophisticated writing on Strategy Management, Operational Planning and Performance Measurement. In this post, I present a simple, actionable Map on these topics. The content of this post will also be released in the form of a single Infographic to Newsletter subscribers on December 15th, 2017. In a previous post titled Digital Transformation Starts with Why -- I bet you never heard that one, I did put special emphasis on the Vision - Mission - Values trio of Statements. I did so because these three statements are the Strategic Foundation upon which all else follows. What should occur before attempting to lay down the Foundation? What are the next logical steps and phases after laying down the Foundation? In other words, what is the complete view of Strategic, Operational and Performance Management? What should happen before the Vision - Mission - Values Statements are crafted and refined? 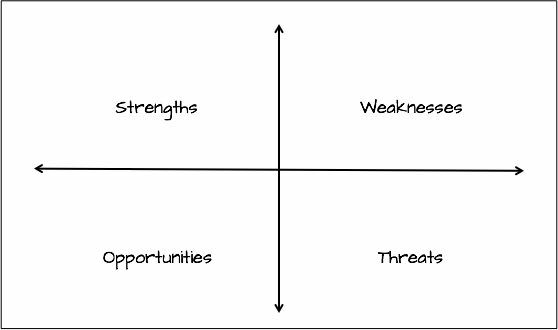 When is the Strengths - Weaknesses - Opportunities - Threats ("SWOT") analysis best sequenced? What are concepts like Strategy Maps, Perspectives, Themes and Objectives distinguishable from the Strategy proper? How should all this strategic analysis and measurement stuff relate to action plans? What are Balanced Scorecards and Dashboards and where do they fit? What is the key difference between Key Performance Indicators ("KPI's") and Business Intelligence Metrics? What happens if you do not have any of the following six key change management ingredients: Vision - Mission - Value, Actions Plans, Balanced Scorecards, Competencies, Rewards and Resources? Readers that are actively engaged in strategic management will recognize many concepts presented in this post. This is because I do not seek to innovate and reinvent these concepts. I aim to relate them to one another in a logical, simple and actionable manner. I also mean to convey to Digital Transformation Senior Executives, Enthusiasts and Policy Advisors that this Map is the starting point. CIO's are members of the Executive Leadership Team ("ELT"). The Strategic Planning exercise mapped in this post must first be completed by the ELT. In a later post, I will explain how a similar, parallel and aligned Digital Transformation Strategic Planning exercise is conducted at the CIO level for direct and functional reports. Internal Interviews (with staff, employees, management)? Retrospective Information about the Organization: Financial, Operational, etc.? Retrospective Information about Comparable Organizations? The above list is not meant to be exhaustive. The list is a means to stimulate reflection on this issue: what research elements do you need to have at your disposal if you want the Executive Leadership Team to be effective when they complete the SWOT Analysis? This is why Strategic Research is Phase 1 of Strategic Planning. Most management teams have heard by now of the SWOT Analysis framework but I have rarely seen it explicitly sequenced in strategic planning. I suggest its optimal consideration is after the strategic research and before finalizing or updating the Vision - Mission - Values Statements. I call Phase 2 "Strategic Foundation" because it immediately precedes the strategy definition effort in Phase 3. The whole point of phases 1 and 2 is to maximize the likelihood of crafting an effective strategy which comes later in Phase 3. 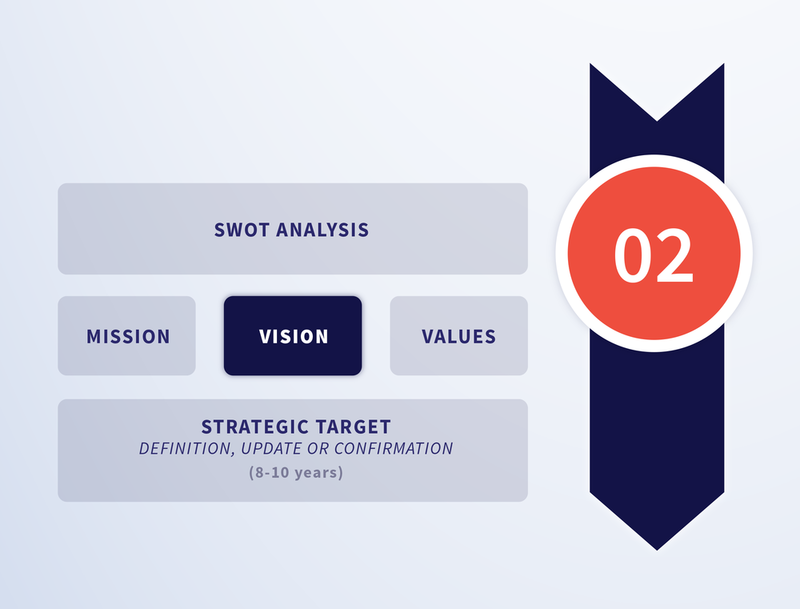 A good SWOT Analysis will naturally lead to a good definition exercise of the Vision - Mission - Values Statements. This part is crucial. I wrote in a previous post on this topic. The key take-away from this previous post is that the Vision, Mission and Values Statements all have an essential role to play in defining where the organization wants to go (Vision), how it will do so (Mission) and the spirit in which it will complete its journey (Values). The final part of the Strategic Foundation is to establish the Ten Year Strategic Target. For some companies, especially in the IT Sector, eight years is often deemed more feasible. This target is all about Big, Hairy, Audacious Goals! Put them in writing. Describe what the organization looks like. You need that longer view and now is the time to set it. Now we get to the heart of the overall Strategic Planning exercise - strategy definition. Is it not the dream of all shareholders, administrators, management teams, public servants, elected officials and employees that their organization excels at picking the right strategy and excel at executing it? If the strategy is wrong, there is little saving grace from a beautiful execution. The strategy must be right to have a chance to move the organization from where it is to where it needs to go. A sound strategy means that the powers that be (the Executive Leadership Team, Cabinet, Board, etc.) have all agreed on and own a set of key decisions that will orient everything that follows for that organization. Themes are areas of strategic focus. They are usually stable and are often a perspective subset. Strategic Objectives, when met, have a direct impact on realizing the outcomes stated in the Vision. They are distinguishable from operational objectives inasmuch these latter objectives seek to deliver specific outputs and results of an operational nature whereas strategic objectives seek to realize the outcome elements of a Vision. These perspectives are read bottom-up. 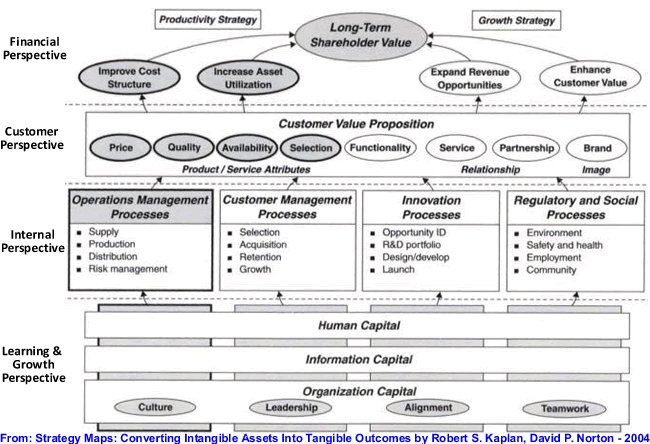 In the above example, learning & growth enables business processes which serve customers to generate financial gains. In a not-for-profit organization, the perspectives are often layered in a different order. Bottom-up, the order could be Donations & Revenue, Volunteers & Staff, Projects & Programs, Beneficiaries. Adopting a generic strategy map will not do. The key takeaway is to figure out which perspectives make sense in your organization, its culture and for the organization stakeholders, and craft it. "Strategy is the set of necessary and sufficient decisions to ensure the success of an endeavour." In a military battle, the strategy might be as simple as choosing the time of day, location and form of engagement with an adversary hence a total of three decisions. Perhaps an additional decision would have strengthened the strategy, such as cutting off supply lines weeks in advance of the engagement. With this addition, the strategy would now have four decisions. A strategy simply consists of several decisions that are all made to ensure the overall success and ultimate outcomes of a project, military campaign, governmental program, product launch or employee campaign - hence the use of the very broad term "endeavour". I call strategy elements "decisions" to reflect the notion that a decision maker or decision-making team must decide what the strategy is. If a military battle is to be had, not having a strategy means you are at the mercy of your adversary's strategy. This logic is entirely transferable to commercial, not-for-profit and governmental contexts. What decisions must the Executive Leadership Team make to ensure the success of the organization? The answer - in the form of decisions - is the Strategy. The Vision - Mission - Values Statements are the best yardsticks to evaluate if your strategy (i.e. your decisions) includes all the necessary decisions and if any decision is missing. What values will guide its presence and actions while fulfilling its journey (Values). If you made it all the way here, and I mean, completing the above phases and steps for your organization, the desire to monitor and assess the velocity at which operations bring the organization closer to its Vision should be keenly felt. Put another way, why go through all this trouble if strategic progress is not monitored? Monitoring progress towards the realization of Strategic Objectives and of the Vision is achieved with the use of Balanced Scorecards and KPI's. 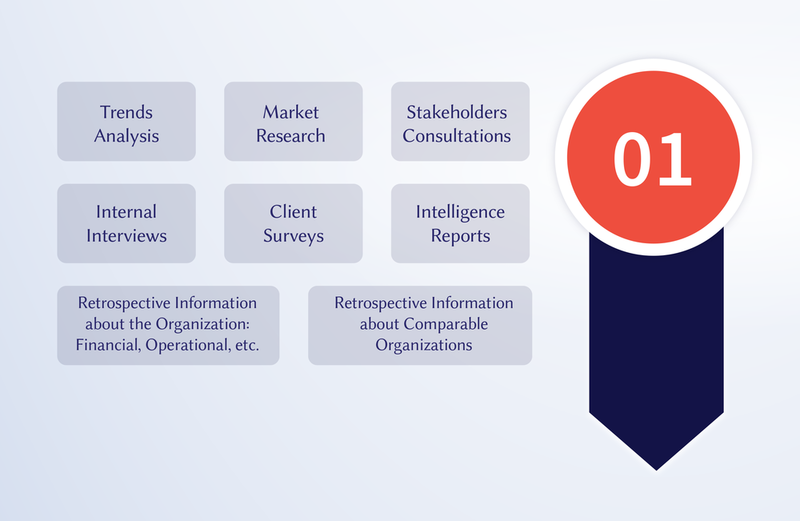 Monitoring progress towards the realization of operational objectives is achieved with the use of Operational Dashboards and Business Intelligence Metrics. How are Balanced Scorecards and KPI's elaborated? The starting point is the Strategy Map, defined above, together with the Strategic Objectives prioritized implicitly with the agreed upon Strategy. If this is your first time elaborating a Balanced Scorecard, start slow, start small, but start. There is no need to be perfect right out of the gate. There is no need to use the perfect SaaS Balanced Scorecard tool. You should be fine using Excel for a while. At this stage, the focus should be on the content of the Scorecard itself and the KPI's, not on the application of the platform used to report on them, especially given that the scorecard and KPI's are bound to change and evolve in their first year. There are a lot of online resources to find inspiration when crafting KPI's such as smartKPIs.com. As we will see in the final Phase on Performance Measurement, the best strategy in the world without a sound Action Plan results in a false start or analysis paralysis, both conditions I assume we all want to avoid. How should this Action Plan be crafted? The first step is to bring the 8-10 years Strategic Target to a three years forward looking Operational Picture. The idea is to work backwards from the Strategic Target and ask "What needs to be achieved and completed in the next three years to be on our way meeting our strategic target?" When you have your Operational Picture, you will be ready to turn your attention to concrete initiatives, projects and ongoing programs, usefully grouped in two lists: the Change Agenda and the Maintenance Agenda. The Change and Maintenance Agendas are lists of initiatives, projects and programs with specific deliverables, known resources and defined governance. They typically have a one-year outlook. In our context (Digital Transformation), a lot of emphasis is placed on change and the adoption of new Information Technology. I think it is dangerous to only focus on change. Most CIO's inherit legacy systems and a variety of processes that are not ripe for change yet. They must simply be maintained. This is why I suggest to keep current not only a Change Agenda but also a Maintenance Agenda. Taking both agendas, an Action Plan should be defined, updated or confirmed every quarter (13 weeks). Why so? Every quarter makes sense not only for financial reporting reasons but more importantly for focus reasons. Human beings tend to lose focus if their work is planned for a longer period than 13 weeks. Popular initiatives such as EOS (organizational) and the SELF-Journal (individual) all point to 13 weeks as the optimal period of time for which work, priorities and objectives should be set. Operational Planning should therefore set which objectives are to be reached for all ongoing initiatives, projects and programs during the next quarter. If wanted, Dashboards and Business Intelligence Metrics can monitor objectives at a finer level of granularity, but this topic is beyond the scope of this post. Performance Measurement should never be an end in itself. In the current context, strategic performance measurement needs to be deployed to validate the strategy and ensure actual progress towards the realization of Strategic Objectives and the Vision. 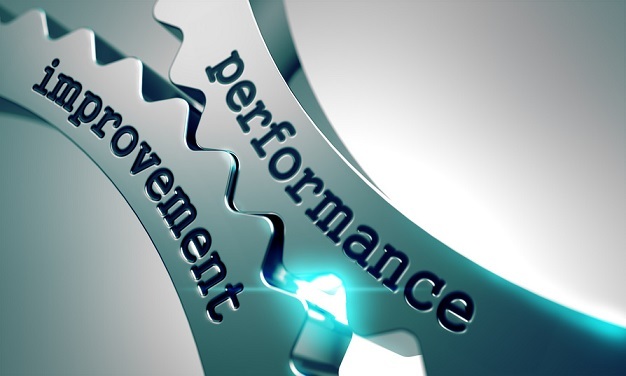 We measure performance so that we can improve it on a continuous basis. Link or do not link KPI's with Compensation and Bonuses? What are the six factors of success in strategic change management? Behaviour measured is behaviour changed. What happens when the measurement is tied with employees or executive compensation and bonuses? This linkage should be done very carefully and only under the next conditions. If you are new at implementing Balanced Scorecards and KPI's, it is preferable to not link Scorecards and KPI's to compensation and bonuses. Why? This restriction ensures the Executive Leadership Team feels free to refine and adapt the Balanced Scorecards in the early quarters because refinement and adaptation will be needed. It is easier to modify Balanced Scorecards and KPI's when they are not linked to compensation. If you establish a linkage, there has to be an explicit understanding how the Balanced Scorecard and/or KPI's objectives can be adjusted depending on unforeseen circumstances. When a major external event on which the organization has no control happens and the whole organization deals with the issues successfully, they should not be penalized because they have not met initial targets that never considered the impact of this external event. Similarly, if there is a deliberate, carefully reasoned change in priorities in mid-year, there should be a mechanism to correspondingly update the Balanced Scorecard and KPI objectives and have that change approved following an established process. Bottom line, Balanced Scorecards should never have the effect of penalizing employees, staff and management for doing what is best for the organization, albeit unforeseen when the quarter or year was planned. Push comes to shove, Operational Dashboard are optional while Balanced Scorecards are NOT! Refine over time. But start. Free yourself from analysis paralysis. Keep it simple. Actionable. If you want to receive a summary of this post in a single infographic, it will be released in my newsletter on December 15th, 2017. You can subscribe to the newsletter here. If you have ideas on how to improve the phases and sequencing, please let me know here or below in the comments section - thanks!